On-loan Newcastle United midfielder Alex Gilliead hopes scoring his first goal for the Luton during Tuesday night’s excellent 2-0 EFL Checkatrade Trophy victory over West Bromwich Albion could propel him into the starting line-up for Saturday’s home game against Crewe Alexandra. The 20-year-old who signed until January on deadline day, has only made six appearances since arriving from St James’ Park, with only one coming from the start, that at Hartlepool last week. Hopefully my appearance will put a thought in the back of the manager’s head for Saturday. Gilliead was a regular for Carlisle during a loan spell there last season and admitted he hasn’t travelled south to be satisifed with a bit part role. He said: “That’s why I’ve come here, I’ve come here to play games and I’ve come here to show everyone what I can do. “Hopefully my appearance will put a thought in the back of the manager’s head for Saturday. “I’ve only started once since I’ve come here, which has been a bit frustrating for me. Gilliead knows it’s not just himself who is desperate for a first team berth, as the likes of Josh McQuoid, Jake Gray and Jonathan Smith all played their parts in midweek too. He continued: “We’re not here just to make up the numbers, we’re here to win games and we showed that. “Other than the first team players that are playing on a Saturday, I think this club has got a lot of hungry players that want to get in that team. “It’s always competitive in training. We know we’ve got quality in training and in games and we know that the players that aren’t playing are all ready to step up and do the business if they need to. On the goal itself, which came about from Zane Banton’s perfectly weighted through ball, Gillead continued: “I think you could tell the relief I had when I put the ballin the back of the net. That always makes it sweeter. 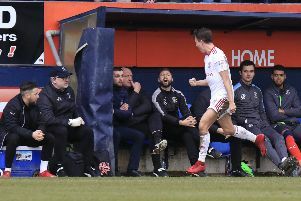 Despite the competition coming in for a huge amount of criticism from certain sections, Gilliead thinks that earning qualification by winning two from two, plus seeing off a Baggies side containing Craig Gardner and Jonas Olsson, shows how importantly Luton are taking it. He added: “They’re a Premiership club, with a few first team regulars in, a couple of them will have a few Premier League appearances between them. “I thought we stuck to our game plan well and I thought we executed it well.